Have you ever felt frustrated working with someone else’s code? Difficult-to-maintain source code is a big problem in software development today, leading to costly delays and defects. Be part of the solution. With this practical book, you’ll learn 10 easy-to-follow guidelines for delivering C# software that’s easy to maintain and adapt. These guidelines have been derived from analyzing hundreds of real-world systems. 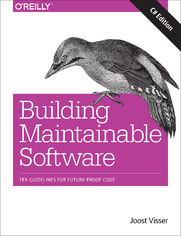 Written by consultants from the Software Improvement Group (SIG), this book provides clear and concise explanations, with advice for turning the guidelines into practice. Examples for this edition are written in C#, while our companion Java book provides clear examples in that language. Objection: Why Should We Invest in Unit Tests When the Current Coverage Is Low? Objection: Why Only These Coding Guidelines?